Breakfast is fast becoming my favorite meal of the day. Unfortunately, right before work is when I have the least time (getting up, running, getting ready, blogging, etc.). With a little planning, though, I find I can squeeze in a Sunday-brunch worthy breakfast in less than 15 minutes. If I don't have time to eat at my dining room table, I grab a to-go container and bring it with me to work. The best days start this way. 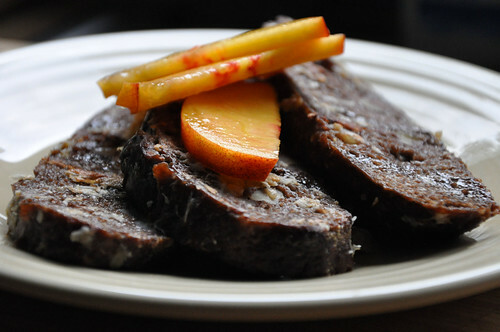 The No-Knead Chocolate-Walnut Bread works well for this easy vegan french toast recipe. 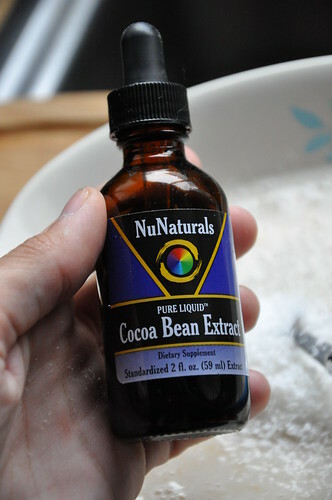 For some extra fancy-ness, add in cocoa extract (vanilla would also work just fine). Add your favorite fresh fruit. Add some maple syrup. Top with chocolate chips. Whatever you do, make it your favorite combination of flavors. Mashed banana acts a lot like egg, which is why this the end result is so successful. Even if you aren't vegan, consider trying this method out. 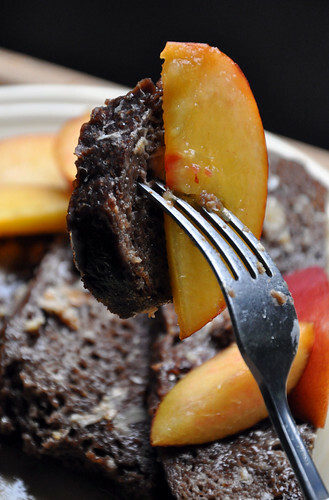 It's a way to get some extra fruit (potassium) in your day if you don't typically like the texture of bananas. 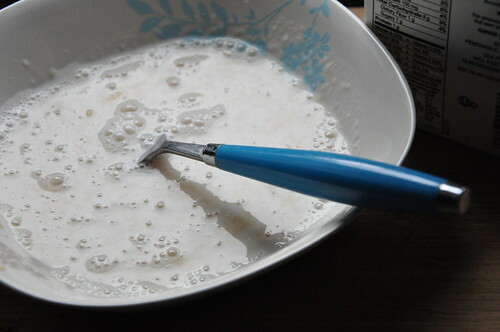 In the bowl of an electric mixer, use the paddle attachment to mash together the banana, the almond or soy milk, coconut flakes, and cocoa extract. 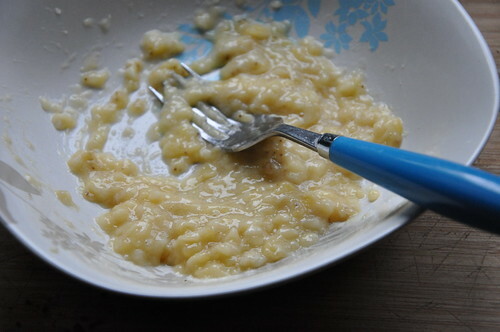 It's helpful to put the banana in first, mash it until "eggy" -- basically with no lumps. I actually did this part with a fork -- no fancy techno-gadgets required! 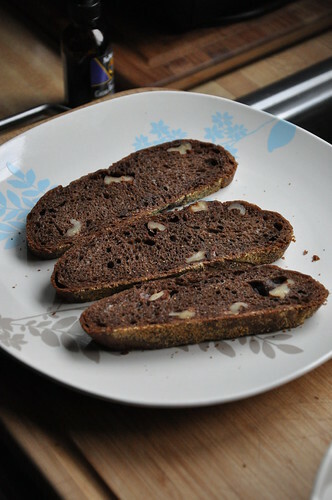 Slice your bread (this recipe makes enough mixture to coat about 6 small slices). 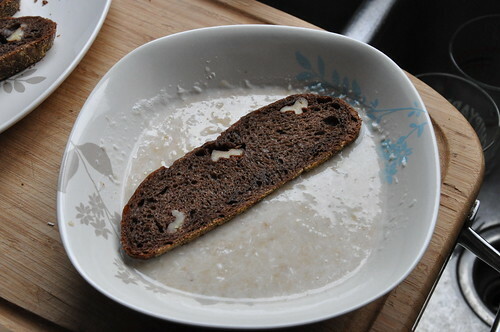 Then pour the "egg" mixture into a shallow bowl and start dipping your slices in it. Put a medium to large pan over medium heat on the stove. Use a little canola or sunflower oil to grease. Then continue dipping your french toast and cooking in the pan like you would for "normal" French toast. Top with your fruit and other toppings. Make over and over and over again. 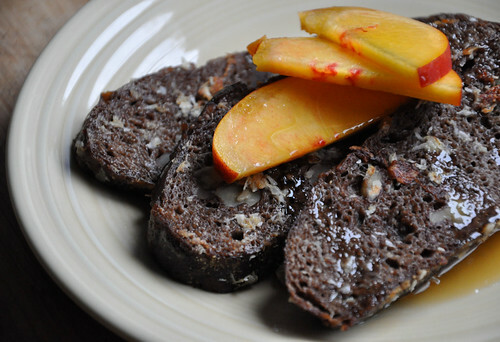 What are your favorite (and fast) breakfast recipes? We'd love to hear 'em. Just leave a comment or email us at neverhomemaker [at] gmail [dot] com.